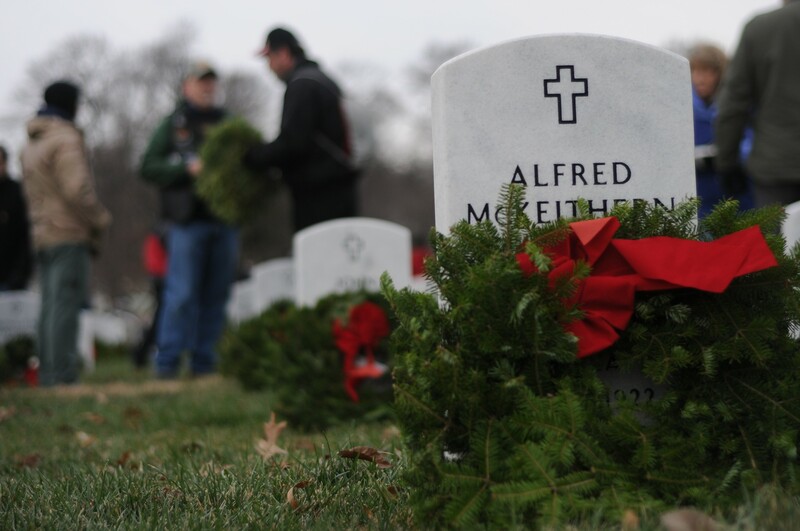 WASHINGTON (Dec. 15, 2013) -- More than 143,000 wreaths were placed on gravesites, Dec. 14, as part of the 22nd annual "Wreaths Across America" event at Arlington National Cemetery in northern Virginia. For more than two decades now, volunteers have gathered to place wreaths on gravesites in the cemetery. The wreaths are manufactured by the Worcester Wreath Company, of Harrington Maine, and come to the cemetery by truck over the week in advance of the event. Wreaths are paid for by both donors and the Worcester Wreath Company. 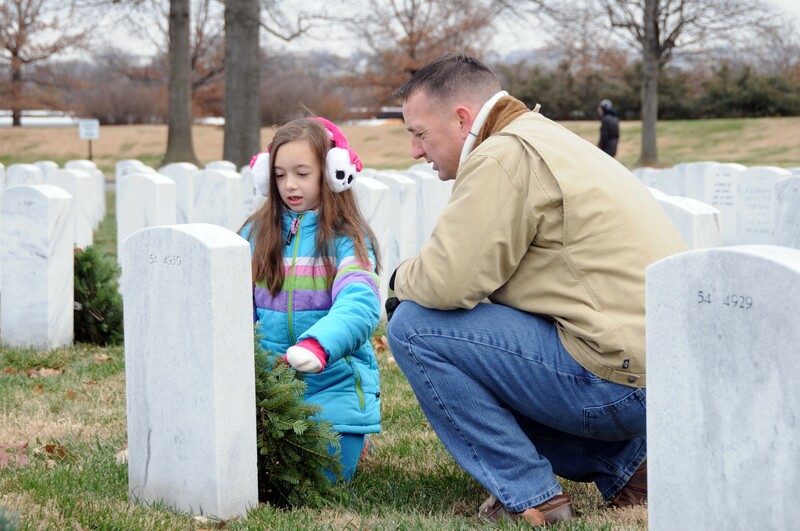 Marine Corps Maj. Daniel Smith and daughter Kara Anne Smith, lay a wreath at a gravesite, Dec. 14, 2013, at Arlington National Cemetery in northern Virginia. 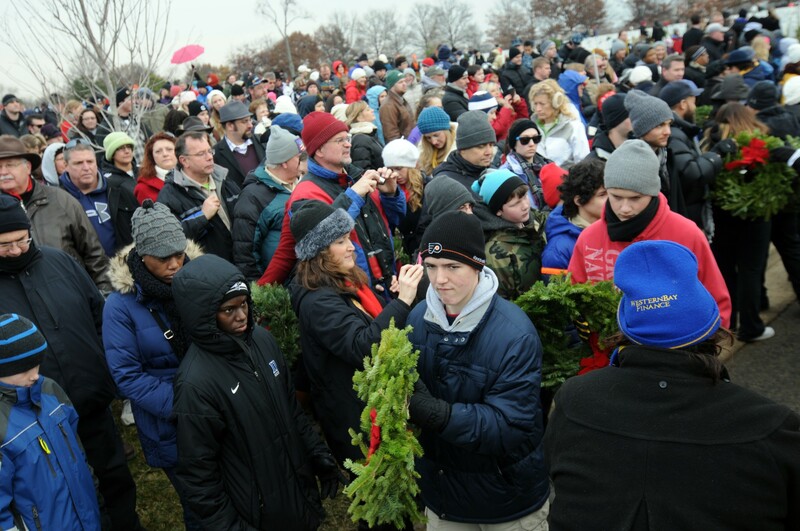 Before thousands of volunteers who had gathered at the cemetery to place wreaths, founder of the event, and company owner, Morrill Worcester, said that over the last 22 years, interest in the project has grown steadily, and he feels now his participation has grown to something more. "About five years ago, things really started to take off," he said. "I really think that it became our responsibility at that point to do what we do. Today I really think it's our obligation to be here." Morrill's wife, Karen Worcester, reminded event participants of the people, and lives, being commemorated during the event. "These are not gravestones, these are lives," she said. "These represent lives that were lost and laid down so we can be free." Out of the backs of several tractor trailer trucks, volunteers passed the wreaths -- Maine balsam with a hand-tied red bow -- to the thousands of civilians, service members, adults and children who would take them out to a single stone and place them there in advance of the holiday season. "I said let's come down early and actually volunteer and put some wreaths on," said Bob Taylor of Redline, Pa.
More than 143,000 wreaths were placed on gravesites, Dec. 14, 2013, as part of the 22nd annual "Wreaths Across America" event at Arlington National Cemetery in northern Virginia. For more than two decades now, volunteers have gathered to place wreaths on gravesites in the cemetery. The wreaths are manufactured by Worcester Wreath Company, of Harrington, Maine, and come to the cemetery by truck over the week in advance of the event. Taylor and ten others of his family drove more than two hours to participate in the event. "What really impressed me was how many served in multiple wars," he said, after reading inscriptions on some of the headstones. "You see individuals who served in three and four wars. It's really incredible, the dedication and commitment that they showed for our country. It's a profound sense of gratitude, to see how fortunate we are to live the life that we live, in part because of what these people have sacrificed." Marine Corps Maj. Daniel Smith works at the Pentagon and lives in the Washington, D.C., area. He said he knew some who are buried in the cemetery -- men he had served with in two theaters of war, over the last ten years. "Several folks we've served with are here, in different areas," he said. "We have been in conflict now for ten-plus years. You're going to lose people. It's an amazing feeling to know that so many people not only contributed monetarily, but are here." Smith's daughter, Kara Anne Smith, said she was glad to have come to the event with her father. "These people have died in some of the most important wars," she said. "They did good -- so we honor them." Vietnam and Army veteran Gerald Reed, of nearby Columbia, Md., attended the event for the first time this year with his wife, Kathy Reed. Reed was drafted at 25, and served in Phu Bai, Vietnam, in 1971, as a radar technician. He'd been a radar technician as a civilian when he was drafted. "I really lucked out," Reed said. "Normally when you are drafted they put you in the infantry. They had a need for radar repairmen, and that's what I did. They didn't even have to train me." While Reed said he doesn't know anybody buried in the cemetery, he did say a high school classmate of his was the first from his county to be killed in the Vietnam War. And Reed's older brother was killed in World War II in Normandy. He said he never met his brother. "My oldest brother Clifford, who died in [World War II], died before I was born," he said. "My mother was pregnant with me when they got word that my brother was killed." Reed says he has six brothers and four sisters. While one of his brothers died at an early age -- just three years old -- he and the rest of his brothers all served in the military. All but one served in the Army. His four brothers-in-law also served, he said. "I think it's absolutely inspirational," said his wife, Kathy, of the event. "I love the fact that maybe there is a little pendulum that is swinging back a little more toward respect, appreciation, remembrance, recollection and giving honor -- that kind of thing. This is an amazing way to do that. There is a lot of distraction in the world. This is a very humbling experience." Kathy also reflected on the words of Karen Worcester, about how each stone represents a life lost. "Every one of them had a hope, a dream, a family, someone who mourns their loss," Kathy said. "This is a small gesture of gratitude."